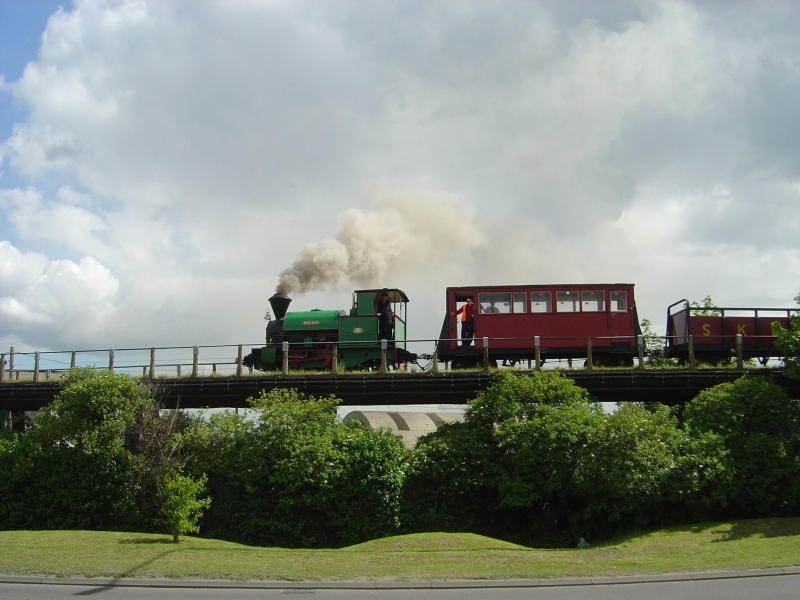 The Sittingbourne & Kemsley Light Railway in Kent is a 2 ft 6 in (762 mm) narrow gauge heritage railway that operates from Sittingbourne to the banks of The Swale. The line was developed as an industrial railway by paper maker Frank Lloyd in 1904, to transport pulp materials and finished products between Ridham Dock, on the River Swale, and the company's paper mill at Sittingbourne, and from the mid-1920s to a second mill at Kemsley. In the late 1960s, the railway faced closure by its then owners Bowater, but the Locomotive Club of Great Britain accepted an offer to operate the railway from 1970. However, the section of line from Kemsley Down to Ridham Dock was abandoned for redevelopment of the paper mills. In 2008-09, the line survived a threat of closure due to the owners of Sittingbourne Paper Mill closing the mill and selling the land. The lease then held by the railway expired in January 2009, but negotiations resulted in the railway being saved, although no public trains ran in 2009. In September 2010, press reports announced the possibility that the railway would operate an anniversary service - over a short section between Kemsley Down Station and the Milton Regis Halt - to celebrate 40 years of operation. The service carried more than 700 passengers over several days during October. In 2011, the railway reopened in late May and operated until the end of September. During this time, Milton Regis Viaduct's deferred maintenance, from winter 2008, was carried out and Essential Land's contractors completed the removal of pipelines around Sittingbourne Viaduct station. The very last train of the season ran over Milton Regis Viaduct to the gate at Sittingbourne Viaduct station - the first public train to cross the Viaduct since 26 December 2008. Please give us your overall rating for Sittingbourne & Kemsley Light Railway.